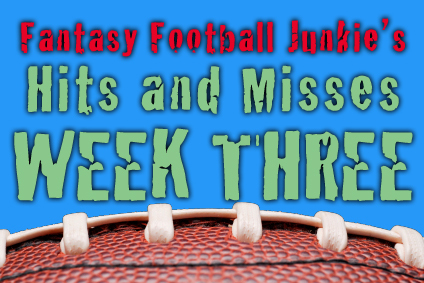 Fantasy Football Junkie | Doing my best at giving you mediocre advice for a hopefully not pointless fantasy football season. Another week of replacement officials and another week of terrible calls. At least we can change our fortunes through the waiver wire! Am I right? Hopefully the NFL and Referee’s Association get this thing figured out soon! In the meantime, lets see if we can’t put a band-aid to that terrible looking team you have. Last week I nailed two hits with Philip Rivers and Martellus Bennett and whiffed on two, getting misses for Jonathan Dwyer and Kevin Ogletree. One of these names is back for a repeat, which one? Read on to find out! 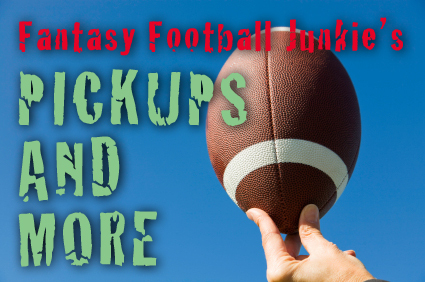 But before we get to the list of possible starters that weren’t, I need to say once again, starting Monday the Fantasy Football Junkie will be writing primarily for a new fantasy football site called FFLockerRoom.com. It goes LIVE on Monday and I would appreciate any of my followers to check it out! I am one of four amazing fantasy minds that have come together to create this new site and it is sure to be a wealth of knowledge. Or as I like to put it, a wealth of possibly mediocre advice that hopefully helps you to win championships! But to be serious, the site is looking great, the content is sure to blow your mind! We will have up-to-date rankings, waiver wire articles, breaking news, roundtable discussions, an Android app and even a podcast! I will still be doing the Hits and Misses here and possibly a few other things, but for week four and beyond, the FFLockerRoom is where I will be spending most of my time. But onto the Hits and hopefully not… Misses! Is Ramses Barden going to be the WR3 with the most promise/power? With Nicks likely only to miss this game, for now, Barden is still the low man on the pole. Is Ramses the new Kevin Ogletree? A more casual fan of fantasy might be asking that same question. And the similarities are evident. Both played in a mid-week contest. Both had breakout performances that led to their teams winning, and both are guys that will be picked up heavily in the following weeks’ waivers. Unless you are in a league that plays first-come first-served… which in that case, open a new tab and see if anyone picked this guy up yet! But it’s also worth mentioning the way in which they each had those breakout performances. Kevin Ogletree did it while both Miles Austin and Dez Bryant were on the field. Which makes me think he has a better chance to sustain his productivity the entire year. 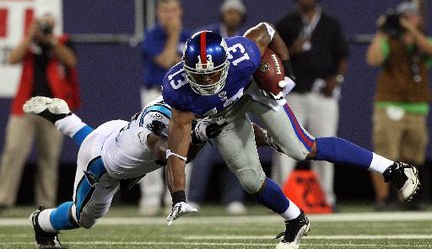 While, Ramses Barden made the most of his opportunity when Hakeem Nicks missed the game due to injury. I bet in the end both receivers finish with similar numbers, around 600-750 yards and a handful of touchdowns. And each will have a couple nice games throughout the year but neither will be worth starting in standard leagues. That is, until one of the stars of either team gets injured for a long period. If that were to happen, I like Barden more but both would be in my top 30 every week. Some unexpected news just came through. Hakeem Nicks did not make the flight to Charlotte and is being ruled OUT for the Thursday night game against the Panthers. It was going to be another tasty matchup for the stud receiver but the Giants are erring on the side of caution. Most people thought he would definitely play, especially after his epic perfomance in week 3 but this is not the case. Victor Cruz and Martellus Bennett are sure to get more looks, as well as Andre Brown out of the backfield. And if I were desperate and looking for a pure sleeper, I would take a shot on Ramses Barden and Rueben Randle. I like the rookie Randle a bit more in open space but Barden sure is a nice red zone threat at 6’6″. While it’s still unlikely Forte plays this week, week three might be the only game he misses. I was listening to the Fantasy Focus podcast from ESPN tonight and injury analyst Stephania Bell said she heard that Forte had “trotted off the practice field” and didn’t appear to be wearing a boot. Which is very good news for Forte owners like myself, because he is my anchor in two fantasy leagues. Keep an eye on the situation, as Lovie Smith has said that Forte does not have a high ankle sprain. He didn’t give anymore info but Forte owners might have dodged a bullet. In other news, I love Michael Bush this week against the Rams. Ugh. I think that about sums up how I feel after watching that Monday Night Football game go into the eleventh hour and then getting up early to take our son to preschool. And I know that many of you are thinking and feeling the exact same way, we miss Ed. 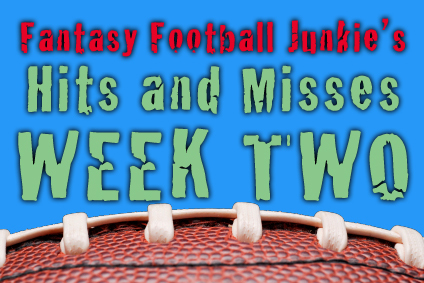 So with that said, here are our waiver wire pickups for week three! Once again, these Hits and Misses come just under the gun! But this time it wasn’t a family vacation getting in the way! Something much bigger is happening for the Fantasy Football Junkie. Much more info to come soon but the teaser is, that I have been contacted to help launch a NEW fantasy football site called FF Locker Room. But until I’m ready to announce that officially, here are this weeks Hits and Misses! I loved the way he played against Denver. And although the Jets have an excellent defensive line, they did give up a huge game to CJ Spiller last week. Dwyer is no Spiller, but he has played very well since the beginning of preseason and is eager to show why he should be the starter in Pittsburgh. I’m a believer after that Wednesday night game against the Giants. He found a lot of space while Austin and Bryant got most of the extra help. As a defense, the Seahawks have to pay special attention to Bryant and Austin and both are healthy. Look for Kevin to get another heavy dose of targets on Sunday. I can’t help it! That Wednesday night game stuck with me. Bennett looked like a beast for New York. He’s such a big target and Eli will hopefully continue to look his way.